During the late 1960’s, Congress began debating the coining of silver dollars once again, largely at the request of Las Vegas casino moguls wanting real coins to replace their dollar-sized tokens. In March 1969, just as the dollar idea began building momentum, World War II hero and former president Dwight D. Eisenhower passed away. That summer, the Apollo 11 lunar landing was one of the most watched events in human history. In October 1969, a bill was introduced to honor Eisenhower and the Apollo 11 mission with a circulating dollar coin. The bill did not finally become law until December 31, 1970. In the meantime, anticipating the eventual passage of the bill, Mint Director Mary Brooks instructed Chief Engraver Frank Gasparro to get busy preparing models for the Eisenhower Dollar coin. Gasparro portrayed a left-facing profile of “Ike” on the obverse. The reverse depicts an American eagle carrying an olive branch symbolic of peace, landing on the moon. The Earth is visible through the depths of space. Reportedly, earlier versions of Gasparro’s eagle were rejected by the State Department, over concern the bird’s expression might be looked upon by other nations as too militant. The Bicentennial of the United States was a major cultural event. Official Bicentennial events began on April 18, 1975. President Gerald R. Ford came to Boston to light a third lantern at the historic Old North Church, symbolizing America's third century. The next day was the 200th anniversary of the beginning of the Revolutionary War. A wave of patriotism and nostalgia swept the nation throughout the Bicentennial era. The US Mint issued special quarters, half dollars and Eisenhower Dollars, dated "1776-1976." The celebration on July 4, 1976 was immense. Festivities included elaborate fireworks displays in the skies above major American cities and the ringing of bells. The ceremony in Washington, D.C. was presided over by President Ford and televised nationally. The nation's official Bicentennial Logo, shown above, was a familiar sight to all Americans throughout the mid-1970s. 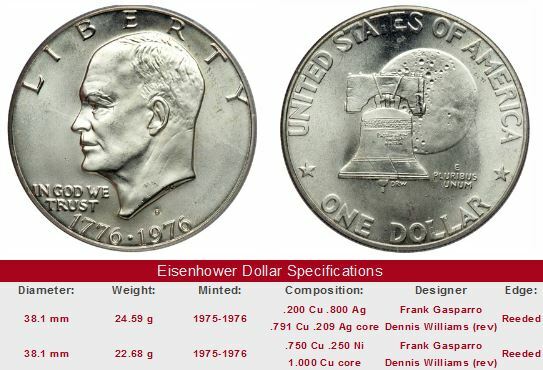 The first Eisenhower Dollar coins were struck in 1971. Ike dollars bound for general circulation were composed of the same copper-nickel clad alloy used in dimes and quarters. Special Eisenhower Silver Dollar coins containing 40% silver were also produced and sold for a premium in both Proof and Uncirculated. These were the only “Ikes” minted in San Francisco. The slang for the Proof version was “Brown Box Ike” because of the packaging color. The Uncirculated version was called the “Blue Box Ike”. Beginning in 1973, the San Francisco Mint also coined a proof edition of the clad alloy for inclusion in the regular proof set. It didn’t take long to realize the American public was not interested in making the Eisenhower Dollar coin relevant to everyday life. The big, heavy coin did not circulate well, seldom seen in retail transactions. At first, the casinos were pleased to have the Ike dollars, but they too soon were disappointed. Gamblers frequently stuck a few in their pocket to take home rather than the slot machines, thinking of them as rare novelties because they were hardly seen elsewhere. Eisenhower Dollar production was sharply curtailed in 1973. The United States staged a grand celebration in the mid-1970’s to celebrate the Bicentennial of the Declaration of Independence. The Treasury Department sponsored an open competition to select commemorative designs for the reverses of the quarter, half dollar, and dollar. More than 1000 entries were received. The winning entry for the reverse of the Eisenhower Dollar coin was submitted by Dennis R. Williams, who linked America’s humble beginnings with modern day space travel by placing the Liberty Bell over the moon. All Ikes made in 1975 and 1976 carry the dual date 1776-1976, in observance of the Bicentennial celebration. Thus, there are no dollars dated 1975. Dollars struck in 1975 can easily be distinguished from those produced in 1976, despite the fact they both bear the identical dual date. Numismatists therefore classify 1776-1976 dollars as Type I and Type II. The Type I dollars (seen above) have the design in low relief and bold, flat lettering on the reverse. Type II has a sharp design and the lettering is thinner and more contoured. Taking into account the two design types, the metallic diversity, and mint marks, there are eight different varieties alone of the 1776-1976 dollars to collect. The regular design returned in 1977, but it didn't last much longer. In 1978, the last of the Eisenhower Dollars were minted. The coin never did catch on, and was considered a failure by many at the time of its retirement. However, for those wanting to see a winning dollar coin, another contestant was about the enter the arena: the Susan B. Anthony Dollar. Federal officials were so certain the “Susie B’s" would win over the hearts and minds of the American consumer. 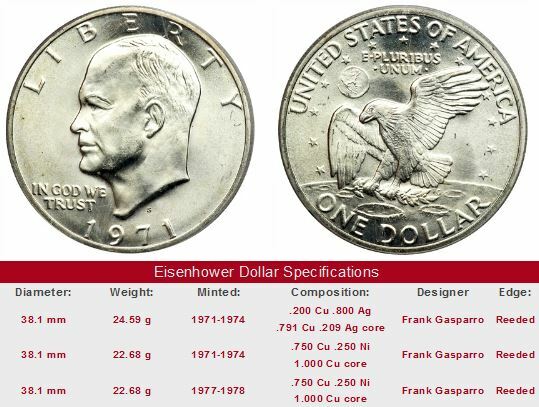 If you make an uninformed decision and purchase an Eisenhower Dollar coin that is overgraded, you'll be sorely disappointed when you go to sell. It won't bring near the money you thought it would. Buyers of Eisenhower Dollars with an eye toward reselling at a much higher price should concentrate on the list above, making sure the Ikes they're considering have earned their high grades from PCGS, NGC, ICG, or ANACS, or are being sold by a dealer of high reputation.